To say that our family room was due for some updated pillows was an understatement. Not necessarily because the pillows were outdated, but the filling sure was. Lumpy, flat.... And since a change was due, why not add a fun new print too? Maybe a little contemporary to boot. I really love the mix now. 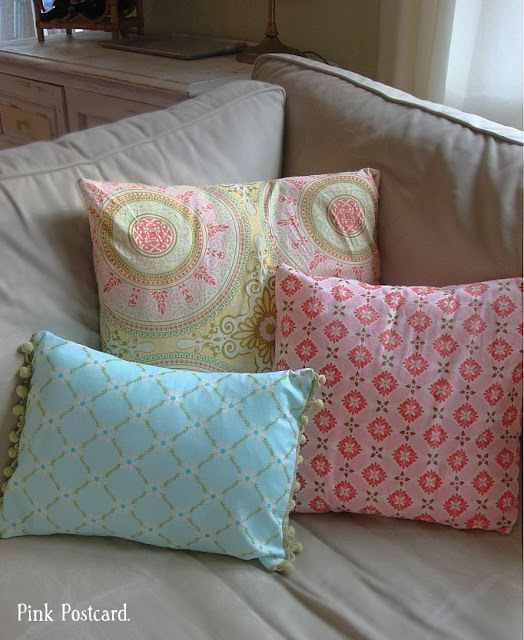 I really loved the print on the pillows, but since making these, my skills at pillow slipcovers has improved dramatically. The problem with these was that I sewed them shut. So the only way to wash the them was to throw the whole thing into the wash.
Now the new versions have brighter colors, and I like the mix of a contemporary Moroccan print with the vintage look. These have a simple envelope enclosure. Once you get the hang of making these, they really are super simple to make. I like having a sweater pillow in the mix! This one was made using the same technique that I used for the flannel shirt pillows. 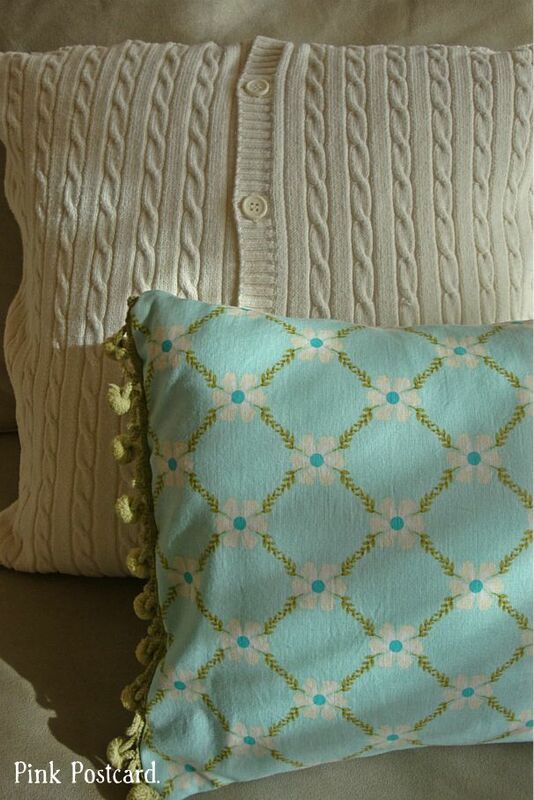 I was able to reuse a bit of the ball fringe trim (that I so dearly love) on the small aqua pillows! They are my favorites out of the bunch. There's still more I want to do here. 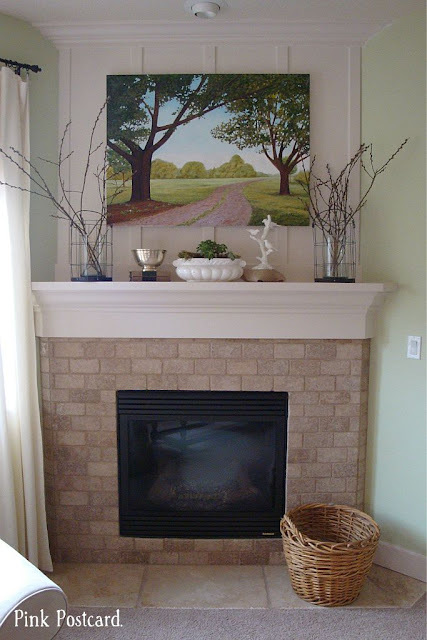 I really would love to add a small boxwood on the hearth. Just have to find the time to go and get one! For now, my new basket is filling in nicely. 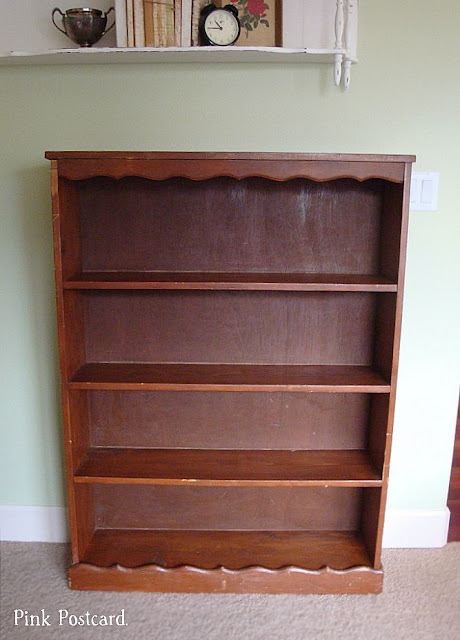 And today, my project is this! My new $25 Will of Goods bookshelf. Hoping to add a soft aqua color to it. Ah. I love finishing up rooms that have been half done and a frustration. So how about you? Are you ready for some new pillows somewhere in your home? 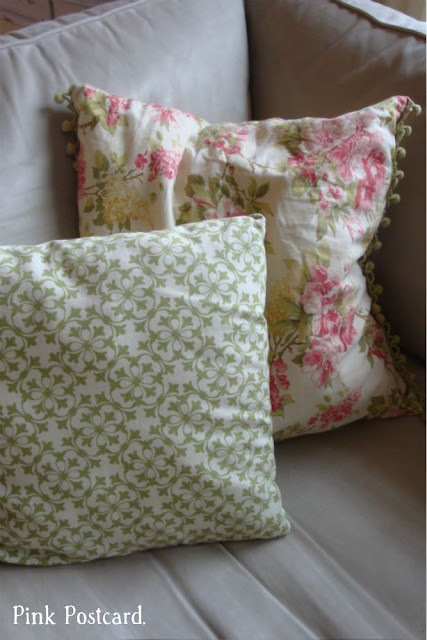 Would you like a tutorial on simple slipcovers, or is that a "been there, done that" thing? I hope you have a wonderful weekend~ if you're in the Willamette Valley, check out the 3 Friends Sale tomorrow, being put on by 3 of my favorite vintage gals! Vintage Trifles, Molly Mo's, and Roost Reimagined. Maybe I'll see ya there! I love the new pillow look...light and vibrant! The pillows are great and I can't wait to see the bookcase aqua! 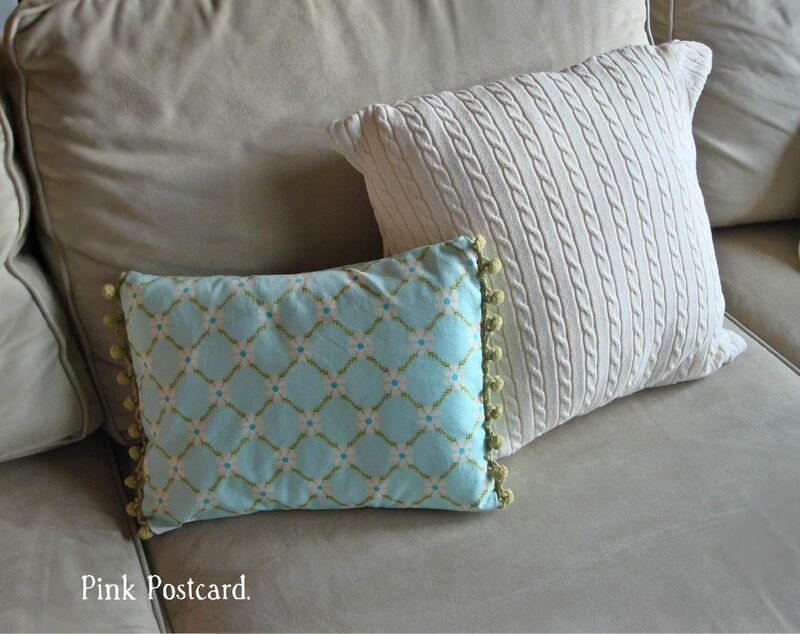 I love lots of pretty pillows and yours look great! I love the way your pillows turned out! That sweater pillow is adorable. 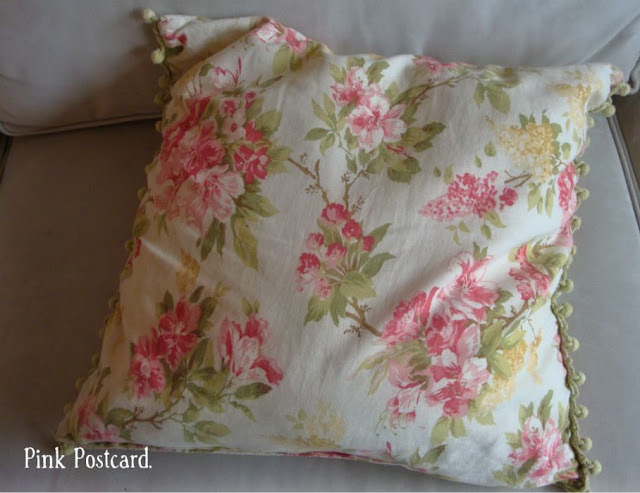 I would really like a tutorial about making pillow slipcovers! Aww I love all your pillows, so pretty! You chose some lovely fabrics! 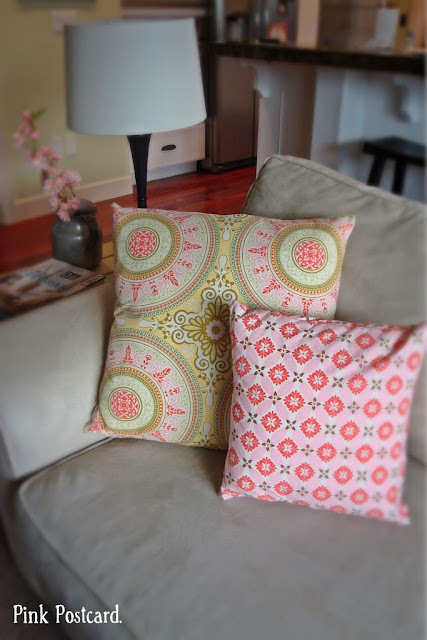 I love using pillows to change up the look of a room, so easy and yet it adds so much!